Nashville’s latest housing numbers for March are in. 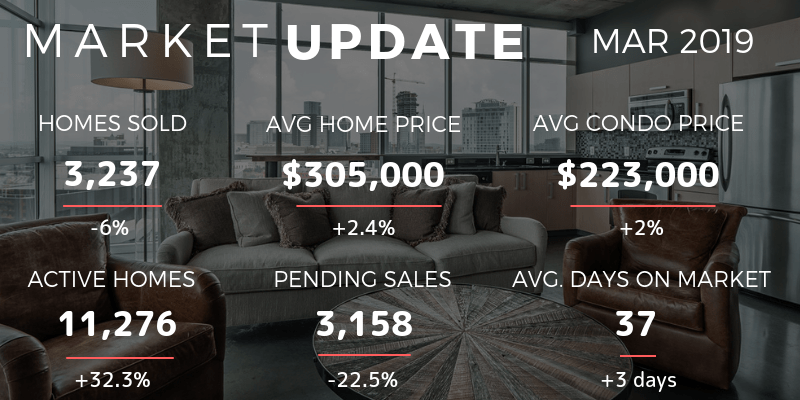 The report from the Greater Nashville REALTORS® showed 3237 home sales last month, which was a 6% decrease compared to the 3,446 closings we saw for the same period last year. The biggest surprise was the 22.5% decrease reported for pending sales in March. Despite the drop in closings and pending sales for March, we are still expecting a very active buying season with low interest rates and more home inventory for homebuyers to choose from. The median residential price for a single-family was $305,000, and for condos, it was $223,000. This compares to last year’s median residential prices of $297,915 and condo prices of $218,600. There were 3,158 sales pending sales at the end of March. This was a substantial decrease from the 4,076 pending sales we saw last year. The average number of days on the market for a single-family home was 37 days. Inventory at the end of March was still on the rise with a reported 11,276 available homes compared to the 8,521 in March 2018.